One bedroom attached apartment 10 minutes south of Natchez. Dine in kitchen features full size appliances including range, microwave, full size refrigerator, pots and pans, dishes and utensils. Bedroom includes one queen bed, dresser and walk in closet. There is one single size pull out sofa bed in living room. Apartment is also equipped with washer and dryer. Bathroom is furnished with tub/shower combo and separate toilet/sink area. There is a 42 inch TV with cd player, Direct TV basic channels and wi-fi included. The space also features a full size desk/work area. I grew up in Natchez and love to share my favorite local haunts with visitors. I love the peace and serenity of my location, just far enough away from the hustle and bustle of town, but an easy 10 minute drive to everything. Guests really enjoy the guiet location and getting back to nature. The property is centrally located for a variety of day trips to the surronding area. I am happy to put together a personalized itinerary based on your special interests! 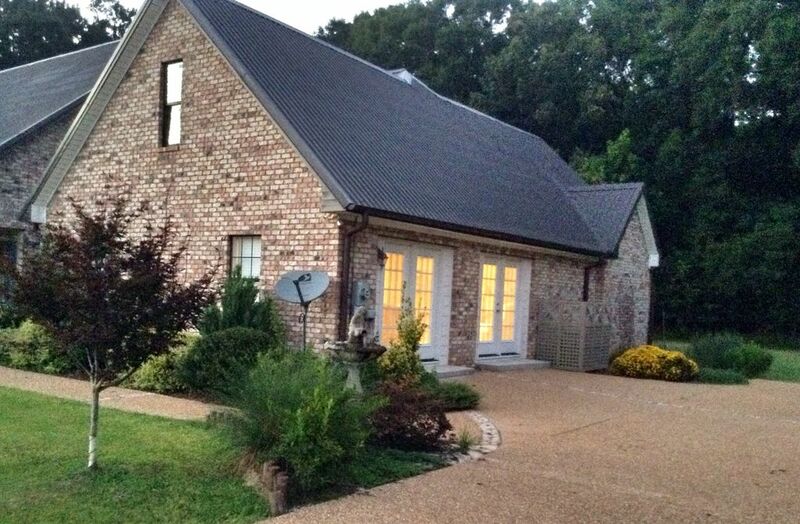 Waverly Cottage is located in a small subdivision in a rural location just 10 minutes South of Natchez. The property backs up to wooded area with frequent visits from deer and other wildlife. mini split plus supplemental floor units. Living area includes love seat and two chairs, table with television, bookcase stocked with reading material and games. Full sized stainless steel refrigerator, no icemaker. Small pets (under 20 lbs) are allowed. Waverly Cottage is centrally located near a variety of activities in historic Natchez, Mississippi. Visitors enjoy sightseeing the many Antebellum era homes, hiking, visiting state and national parks nearby. Natchez and the surrounding area offers a wide variety of dining opportunities from traditional southern fare to sushi. Guests may wish to try thier lick at Magnolia Bluffs Casino located on the Mississippi River. The area is easy to navigate and there is virtually no traffic. We are also a stop on the well travelled Blues Trail. All venues afford easy parking and access. Southern hospitality is a way of life here, and you will find locals very friendly and helpful. We have an awesome visitor's center which is a must when planning your stay. There is always some special event or festival going on here so be sure and check out the visitor's center to for the most current information on local events.